Last Monday, I was looking for software which can help me to convert my MSG files to PDF format. And my search was on for software that can do its work efficiently without giving me headaches and this tool- MSG to PDF converter did what it was made for i.e. to solve user’s problems in just two or three steps. What used to take endless steps of conversion now can be done in few minutes. Most of the users which use outlook are familiar with MSG Files and the same goes for PDF files; almost everyone knows what PDF and MSG means and if you don’t then it’s not an issue. MSG is of course a file extension and a file format which is used in Microsoft Outlook. It can contain ASCII text for main message body and for headers as well as attachments. Whereas PDF means a format basically to grab and sending the E-Documents (Electric documents) in the same format as they were. It’s an e-mail program which is developed by Microsoft that helps users to forward and receive e-mails on their PC. At this time we have two versions of outlook; Microsoft Outlook and Microsoft Outlook Express. Microsoft provides file format which is used to save respective Outlook items but it’s not a clear file which you can easily view with Microsoft Word or with Notepad. These MSG Files are developed on compound file binary format and needs a MAPI application to view the streams. To build an MSG file from outlook is easy, you just have to drag and drop the file you want from your outlook folder to your desired location. You can also go for the other method ie to select the save as menu choice from your outlook and then save it to the location you want to save the item. Either way outlook provides an easy method to export the MSG file. The file would be saved as with the .msg extension. We can also drag and drop MSG files back to our outlook and the file would now return to its original format and not as a MSG format. PDF (Portable Document Format) is a format that has all the aspects of a printed documentas an electronic copy that we can view, edit, print and forward too. They are developed by Adobe Acrobat and to look and use these file we need the FREE Acrobat Reader which is easily available online. After you’ve installed Acrobat Reader it will automatically when you will double click on your PDF file. A PDF file can contain one or more pages and you can zoom in and out each page separately. They can also enclose various types of fonts. So, if you do not have Microsoft Outlook present in your computer then don’t worry because there is a way to view MSG files by simply converting them to PDF and for doing this you will require bug-free software and that software is MSG to PDF Converter.If you are searching how toconvert Outlook message to PDF online daily on goggle then your search is over as you can use MSG to PDF converter which is reliable and won’t leave you with any further issues. The program helps to convert Outlook MSG messages into PDF with Attachments. 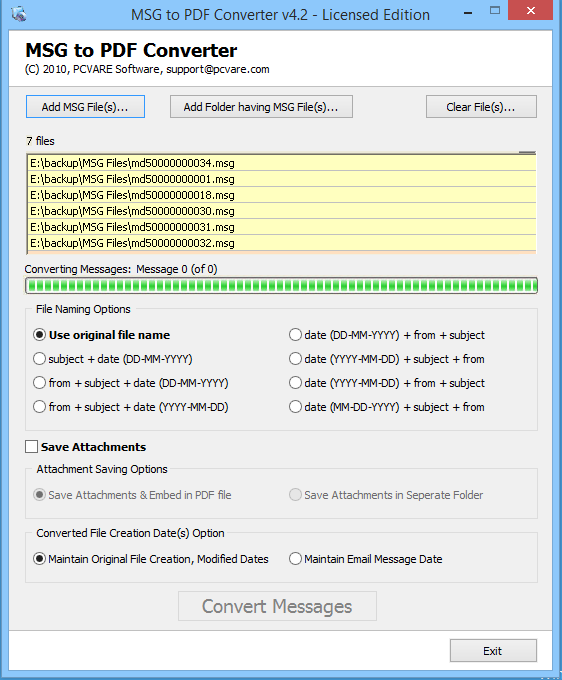 There is also Batch Option available to convert multiple MSG files into PDF at once. You can also try it before going with the full version of the Software. Thank you for giving this helpful post. I handled it and got 100% conversion result to convert MSG Files to pdf. Thanks for the useful information. But there are many manual methods that can easily convert bulk MSG files to PDF with attachments by using Outlook add-in or print email messages with Adobe as PDF option directly. Any non-technical person can use SysTools MSG to PDF Converter to view and convert MSG files to PDF without any hassle.